You’ve painted a masterpiece or illustrated a work of art. Now what? Succeeding in the arts is tough enough. When you’ve made something great, the first thing to do is to create a digital copy. Whether this is just for your own peace of mind or to make a reproduction to sell or share, it’s just smart. The bad news? A lot of scanners are actually terrible at capturing artwork. I’ve waded through the good, the bad, and the ugly and came up with this top 10 best scanners for artwork list. I included scanners for large formats and small, at a range of price points, and with various terrific features. 11.1 Scanner vs Camera – Which is best for my artwork? 11.2 Which one has the highest resolution to scan commercial art for large size prints? 11.3 How much DPI do I really need for prints? To find the optimum scanner for you and your work, check out this list of the best scanners available right now for scanning artwork and illustration. The Epson Expression 10000XL was designed with graphics artists in mind. This is seen in the wide format with an A3-sized (12.2 by 17.2 inches) scanning surface. Making it even better for scanning large work, the lid comes off. The 2,400 dpi resolution scan quality it offers is outstanding. You get 2400 x 4800 optical resolution with 3.8 Dmax optical density. The precision of color is excellent, with 48-bit color depth and 16-bit grayscale. It’s easy to zoom to capture detail, with 50% to 200% zoom supported with the ability to move in 1% increments. 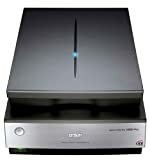 Scanning speed is fast, offering a maximum speed of 2.7 ms/line. Of note, the faster the scan speed is, the lower the quality. A helpful software bundle is included with this scanner, including EPSON Scan 2.2, MonacoEZcolor with reflective IT8 Target, Photoshop Elements 2, and ABBYY FineReader Sprint OCR. Verdict: If your art would be best served by a large, wide-format design, the high-quality but spendy Epson Expression 10000X is the foremost choice. Overall, the Epson Expression 10000XL is the best scanner for artwork. So you want a good large format scanner but you don’t have much to spend? This option from Plustek is the cheapest A3-size scanner worth considering. Is it as good as some of the Epson models? No, the quality is for sure a bit lower. But ultimately, this might not be the dealbreaker you’d think. In fact, the quality with this scanner is really very good. It features an optical resolution of 1200 dpi. The color is pretty true, with 48-bit Color and 16-bit Gray-Scale. The scan speeds won’t any races, but at 15 seconds for color and a grayscale speed of 9 seconds, the speed isn’t bad. With four convenient one-touch buttons, it’s easy to get preset actions going quickly. You can send scans to email, include OCR for text during scans, and create PDF files instantly. 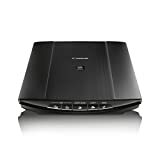 This scanner has an LED light source that means you don’t need any warmup time and there won’t be any change from scan to scan over the lifetime of the scanner. Some basic software is bundled with the 1180, including some simple but decent image processing and document management tools. Verdict: The Plustek A3 Flatbed Scanner OS 1180 isn’t the very best wide-format scanner but for the price it performs impressively well, making it a good choice if you don’t have much to spend. There are some types of artistry you just don’t want to scan in a traditional manner. Can you imagine putting your beautiful oil pastel painting down on a scanner and closing the lid? That could be disastrous. This solution from Fujitsu gives you a way to get a scan of your art without having to risk damage of any kind. This scanning solution was technically made to scan books, another medium notoriously difficult to scan well with a traditional scanner. The mechanism for capturing the image is really more like a camera than a scanner. As it was designed especially for scanning books, there are some special features that apply to that kind of use. For example, the software can help flatten the curve of a book’s spine or remove fingers that remain in the frame. The scanner also has an auto-scan feature when it detects a page turn. When it comes to scanning delicate papers or paintings that you don’t want to be smudged or otherwise damaged, this scanner does an adequate job. It is our top pick in the best book scanners buying guide. The resolution is only 285 dpi x 283 dpi which may be disappointing. Similarly, the accuracy of the color is not as good as you might like. The software has various enhancement features but these paradoxically often make the scan look worse, with colors becoming less vivid. It is possible to get some beautiful artwork scans with this scanner but you’ll generally want to avoid the software’s enhancing tools and instead take the raw file to a picture editing program like Photoshop for fine-tuning. Verdict: The Fujitsu ScanSnap SV600 Overhead Book Scanner offers a way to scan delicate papers and artwork without damaging them but it doesn’t give you the highest quality. The Xerox name is known primarily for copy machines but copying and scanning are essentially two sides of the same coin. Like those big copy machines everyone knows, this scanner is a reliable workhorse. The scanning surface is large, in an A3 or 11.7″ x 17″ size. This scanner offers automatic image enhancement, although you can choose not to use these tools if desired. 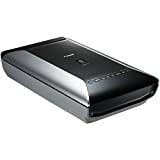 If you want a scanner that does a good job scanning your art but can also scan documents, this might be a good option. It’s easy to turn scans into searchable PDFs using OCR. A nice feature of the DocuMate 4700 is the ability to set 9 presets. This lets you specify resolution, color, cropping, and file format settings as well as the destination to send the scan. Then, you can get the scan you want with just the touch of a button. These presets can save you a lot of time. Verdict: The reliable Xerox DocuMate 4700 Color A3 Flatbed offers wide-format scanning with decent quality at a more reasonable price. Epson is the foremost maker of scanners and this model makes clear why. The price is steep but the quality is incredible. With this scanner, you get stunning clarity, with an incredible 6400 dpi resolution. It offers superb range, making sure to pick up on subtle details like fine shadows, all with smooth gradations. Unique in the scanner world, it has a dual lens system. Depending on what you’re scanning, it will use one lens or the other. This scanner is smart and it automatically uses the lens that will provide the best quality. When scanning film and prints, the V850 Pro has the ability to automatically remove dust and scratches, saving you hours or frustrating time with Photoshop or a similar program. Speed is another advantage. The ReadyScan LED light source means you can scan fast, without waiting for it to warm up. To make scanning film easy, four holders are included to accommodate twelve 35mm mounted slides, three 35mm film strips, one medium-format strip, and one 4×5 inch frame. LaserSoft Imaging SilverFast SE software is included to control highlights/shadows, gradations, selective and global color, sharpening, descreening and scaling, and more. Verdict: If you want your scans to pick up every detail of your illustrations with precise color, you really won’t find anything better than the Epson Perfection V850 Photo Scanner. There’s a reason Epson is on this list more than any other brand. Scanners are an area where this company really excels. With a built-in transparency unit, the V600 makes it easy to scan slides, negatives, and medium-format panoramic film. You can use the scanner to make terrific enlargements from film with 6400 x 9600 dpi for enlargements up to 17″ x 22″. This scanner has great software with a tool called DIGITAL ICE for doing touch-ups, especially for restoring photos or film that has any kind of damage. You can further edit scans with the also-included Arcsoft Photostudio software. This software is better than the software included with a lot of other scanners. It’s easy to use the V600 with its four customizable buttons to scan, copy, scan-to-email, and create PDFs. For scanning particularly large or particularly delicate art, you can easily remove the lid to lay the work flat on the scanning bed. For Epson, this is a bit of a budget model but it outperforms other much more expensive scanners. Verdict: The Epson Perfection V600 may be a lower-end model for Epson but it sure performs like something much pricier, offering great value. That said, don’t let the name fool you into thinking it’s perfect. Epson’s V600 is definitely on the lower end for the brand, but the V39 is truly a budget model. The price is nice but because it’s Epson, the quality isn’t what you’d expect based on the price. It features 4800 dpi optical resolution. The scan speed is fairly fast, with a simple B&W document only taking 10 seconds. A 600 DPI color scan will take 30 seconds. The higher quality you want, the slower the scan speed will be. Convenience is a big attraction for this model. You can easily send scans to Facebook, Evernote, Google Drive and other cloud services. It’s also simple to scan directly to emails and PDFs using the straightforward buttons. The included software is okay, with the Windows-only ArcSoft Scan-n-Stitch being the most valuable. This allows you to scan a really large piece of art piece by piece and then the software will merge the files together into a seamless image of the whole thing. Scanners tend to take up space, especially annoying when it’s a tool only used occasionally. The V39 takes that into account by offering a stand that allows you to store the scanner upright when not in use. Verdict: Proving why Epson is the scanner king, even the budget Epson V39 has a lot to offer. Is your medium film? Or does your art tend to be smaller in size? This might be the scanner for you. It’s much smaller than other options on this list. As long as your artwork is small, this scanner can offer an incredible resolution. With 9600 x 9600 maximum color dpi, the resulting scans will be premium quality. This scanner has a Super Toric Lens, which helps make sure the scans are incredibly sharp and detailed while minimizing noise. Color is quite good, with the 48-bit color depth and over 281 trillion possible colors. Seven EZ Buttons can be customized to streamline the scanning process. Overall, this scanner is easy to use and the included software can add value. Verdict: The small and affordable Canon CanoScan 9000F MKII some of the greatest scans but it will only work effectively for small-sized pieces. What did we do before the cloud? It definitely adds a lot of convenience to our lives. Tools that make it easy to use the cloud are first-rate, as far as I’m concerned. This budget Canon scanner has incorporated Send-to-Cloud functionality, making it easier than ever to save your files to places like Dropbox, Google Drive, and Evernote. Especially for the price, the quality is quite good. It features a 4800 x 4800 dpi maximum optical color resolution and 48-bit color depth with over 281 trillion possible colors. Speed is a strong selling point with this model, with the ability to scan a color illustration in 10 seconds. It has a Z-Lid expansion top, so you can scan thicker artistry with ease. EZ buttons simplify the scanning process, allowing you to determine your preferred settings, saving you time if you always scan the same kinds of things. There is some included software that offers a bit of value but nothing really outstanding. Verdict: The Canon CanoScan LiDE220 A4 stands out for being budget-friendly and making it simple to send scans to the cloud. Are you the kind of artist who is sketching all the time? Sometimes in random sketching, a cartoon or illustration will just hit. If you’re on the road when this happens, you might worry about losing this perfect art. Never fear, this super portable scanning solution will let you capture the magic easily wherever you are. This definitely isn’t a solution for crafts, paintings or anything other than flat, relatively thin paper as it has to physically slide through the scanner. Actually, you don’t have to send the artwork through the scanner. You can also undock the magic wand and drag that physically over the drawing. This option might open up a bit what you can scan. You can scan paintings this way or even an etching or an engraving, although getting those just right will require some finessing of the settings. Unfortunately, when you are using it as the magic wand and not docked, the maximum resolution is lower at only 1050 dpi. That’s still really quite decent and the color accuracy is impressive. A really great feature of this scanner is that you can use it without it being connected to a laptop or anything else. It has an 8GB SD card plus you can add a microSD card up to 32GB. You can save many thousands of documents between these two storage solutions so even if you hit a streak of some of your greatest work ever, you’ll probably have enough room to store it all until you’re able to offload the files to a computer. When the scanner is docked, you can get a maximum resolution of 1200 dpi. Verdict: The affordable and user-friendly Vupoint ST470 Magic Wand offers incredible convenience with its portable, flexible design. Scanner vs Camera – Which is best for my artwork? There are too many variables here to give an easy answer. What kind of artwork? What kind of camera? How big is the art? Do you have a good setup for art photography? For a lot of artwork, photographing it with a really nice DSLR or other pro-model camera with the right lighting will result in the highest quality image. This is especially true for certain kinds of art. Photographing an imprint on fabric, for example, makes more sense than trying to scan it. For a lot of illustration including cartoons, a scanner might give you the best results but only if you really know what you’re doing in terms of settings. Scanning line drawings as JPEGs will result in an image with extra noise. Scanning as PNG or PDF will often circumvent this problem. If that sounds like too much of a challenge, photographing those illustration makes sense. If you want to turn your drawings into vectors, start with a basic scan. Then, you’ll need to do line tracing in an appropriate program to make a vector. If you’ve sketched a quick storyboard and don’t need high resolution, a simple JPEG scan should suffice. If you work with paint or film and your work isn’t huge, a scanner will serve you well. A scanner generally requires a less elaborate setup than photographing. Which one has the highest resolution to scan commercial art for large size prints? The Epson Expression 10000XL will give you the highest resolution for reproduction of your art. How much DPI do I really need for prints? You tell me – how much DPI do you really need? We all have a different answer to that question. It’s personal, just like art is a representation of the artist. A scan is a depiction of our art in a digital format. You want it to be as close as possible to the original, of course. Ultimately, a resolution as low as 300 dpi will be good enough for some art but most of us want something higher. Which scanner do you have your eye on? Let me know. Do you have questions? Please ask in the comments. I’d also love to see pictures of your art! Thanks for leaving a review here. 16bit gray scale and 1200dpi should still allow for a reasonable amount of details with ink drawings, what you are describing may be an issue with this particular one or with the mac drivers and software. For sure it is not in the same league as the Epson or Canon scanners though. I am scanning my own paintings and other artwork of various sizes (up to 18″x24″ and beyond) and I’m surprised your reviews don’t talk about the ability to remove the lid of a scanner. I consider it a dealbreaker to not be able to remove the scanner lid completely. For a long time I was looking for a scanner that could scan pencil drawings well and be high quality and bigger than A4 but could not find anything. I have the Epson Photo V370 but the settings are completely irrelevant, the background is darkened and you need to do too many adjustments and it takes too long, there are no simple background suppression, contrast, darken options. I had that on those large Epson printers at school but they’re not high quality. I tried the Epson 11000XL somewhere though it takes like 5 minutes to scan each sketches. Now I’m searching for foreign scanners because I can’t find anything for a reasonable price that can simply scan pencil drawings. Of course, with a portable scanner you’ll end up with pieces off puzzle wich you’ll have to stich together in photoshop. But with all that, if the quality of the scan is good, i’m ok. So let me konw, please, if you have a review for this method! What scanner do you recommend for cut paper collage w/ some fabric and photo collage mixed in? I paint my own textured on tissue paper (high flow acrylic–w/ brushes) and watercolor paper, book pages and old maps (gouache and watercolor). I assemble the images by hand on watercolor paper but do some manipulation in procreate and Ps as well. It would be great to be able scan in final art elements to manipulate as well as scan in the final pieces to post online or send to editors, agents, art directors and publishers in the children’s picture book industry.